VIRUNGA NATIONAL PARK, Democratic Republic of Congo, October 25, 2012 (ENS) – Mai Mai rebels attacked a ranger patrol early this morning in Virunga National Park, killing two park rangers and one government soldier who was assisting the rangers. Three other government soldiers were seriously wounded – one critically. The battle ended with five Mai Mai PARECO rebels dead. Two others were wounded and captured. The wounded rebels are in custody at the hospital in Vitshumbi. The rangers are on duty to protect 200 Endangered mountain gorillas as well as a small population of Critically Endangered Grauer’s eastern lowland gorillas that inhabit the park along with chimpanzees, okapi, forest elephants and buffalo. Attacks such as these have been on the rise since the most recent eruption of conflict in May, but none have been so deadly, says Virunga National Park Chief Warden Emmanuel de Merode. The attack took place at Mwiga Bay, an area just west of the fishing settlement of Vitshumbi on Lake Edward in the park’s central sector, where a recent increase in the presence of armed militias has resulted in a growing number of attacks on park staff. The outbreak of civil war in May resulted in the withdrawal of DRC military forces from much of Virunga National Park, leaving the park’s staff vulnerable to the many illegal armed groups that frequent the area. These include the FDLR, a Rwandan militia group widely considered to include combatants responsible for the Rwandan Genocide in 1994, and Congolese militias known as Mai Mai PARECO and Mai Mai PRM. These armed groups have become increasingly involved in poaching for ivory and bushmeat and illegal fishing on Lake Edward, as well as looting the local population. Virunga is Africa’s oldest national park, established in 1925, and has been a UNESCO World Heritage Site since 1979. The 7,800 square kilometer park in eastern DRC is managed by the Congolese Institute for the Conservation of Nature, the Institut Congolais pour la Conservation de la Nature, a government agency. 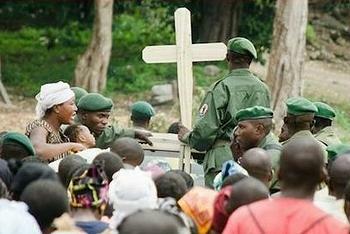 More than 130 rangers have been killed on active duty since the beginning of the civil war in eastern Congo in 1996. Virunga Ranger Paluku Matembela, killed in today’s attack, leaves behind a six month-old son whose mother died in childbirth and their 14 year-old daughter. Virunga National Park has just set up a “Fallen Rangers’ Fund” to assist the widows and orphans of rangers killed on duty with start-up funding from the United States government, the European Union and private foundations and individuals. He says the two ICCN rangers who died in the attack today left their families in difficult financial straits. “We would like to raise $1200 for each of the two families to pay for funeral and other expenses, plus help through the tough year ahead. We would also like to raise enough money to provide each family with $50/month for the next five years as part of the Fallen Ranger’s Fund commitment to support the families of our staff killed in the line of duty,” he said. The chief warden is asking people to click hereto donate to the support of the two fallen rangers’ families. “What you give will make a dramatic difference in the lives of these people,” he said. 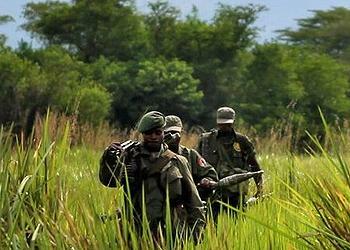 Some 274 park rangers protect Virunga National Park. Poaching, wildlife trafficking and habitat destruction remain the key threats to the survival of the wildlife in the park. According to research cited by the IUCN Red List of Threatened Species, the Virunga subpopulation of mountain gorillas has suffered from more than a decade of war and instability in the region. Threats include incursions by militia, habitat destruction for firewood and farmland, illegal cattle grazing, illegal timber extraction, and illegal hunting, including snares set for other mammals such as antelope that can injure or kill gorillas. In 2004, 15 square kilometers was deforested for conversion to farmland, and recently there has been a sharp increase in timber extraction for the illegal production of charcoal. There has also been a resurgence of poaching for the illegal pet trade and bushmeat. Since 2003, 12 orphans – both Grauer’s and Mountain Gorillas – have been confiscated from traders and taken into the care of veterinarians. 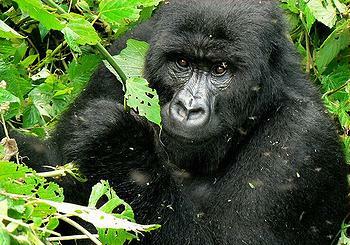 In 2007, at least eight gorillas were shot dead in three incidents in Virunga National Park. Since September, the Mikeno sector of the park, where the mountain gorillas live, has been under rebel control and park authorities have been prevented from monitoring the gorillas. The failure of a 2008 Peace Conference means that the region remains volatile and the gorillas vulnerable, despite the efforts of international nongovernmental organizations and UN observers.